Weekly Words Challenge #58, hosted by Pickled Beef! Ack! He was such an adorable little fluffball! Awww, he was so adorable!! He still is of course, but you know what I mean! he’s beautiful now, of course, but oh, how cute he was then!!!! I’m officially in love with Wolf the rest of the way. That first picture made me squeal! Cuteness overload! Oh, he was a pretty baby — and what a gorgeous face now! Love the babydog pic. So sweet! Awwwww, what a cute baby! I just want to squeeze him! OMG what a snuggly-puss…then…AND now! He is so sweet. The pictures are great. I love that third one — he still has a baby face. omgosh, he looks sooooo good! i’m in love! I simply must continue my research into pills that keep puppies puppies and babies babies. They are so much better that way. Wolf was a really cute puppy, but he is a beautiful dog too. Aww, puppylove! He is beautiful! I love the grown Wolf sleeping, he looks like he is smiling! you already know that I am a Shiba Inu LUVAH … that said, I would love to have another move in with us and would be especially tickled if he’d be have as gorgeous as Wolf! those are some wonderful shots. What a beautiful, photogenic dog you have there! Also, having read the info about Sibas as you suggested, I’m guessing quite a handful, too – obviously written by a Siba lover who also has common sense and a great sense of humor! Sounds like sort of a cross between my neighbors’ German Short Hair and our shih-tzu, temperament-wise, anyway. See, the Short Hair defines BOUNDLESS energy. Needs to go to the dog park EVERY day, despite the fact that he has a huge back yard, and is walked at least 3 miles every day, rain or shine. MUST PLAY. Plays to the point of exhaustion. I said, in my ignorance, “Well, he’s just a puppy. He’ll calm down.” Nope. They go full speed all their lives. Now, our shih-tzu, while charming, adorable, sweet-natured, loving and beautiful, has a will of iron, like the rest of her breed. She takes commands like NO! SIT! STAY! and COME! as mere suggestions. Anything that moves interests her – including cars, and the kids across the street. “Obey” is also not in her vocabulary. I have also heard that they are, shall we say, an incredible challenge to house-break. We got ours as an adult dog, so I missed that thrill. Thankfully, if a shih-tzu loves you, he or she will often do what you ask – but only because they WANT to at any given moment. 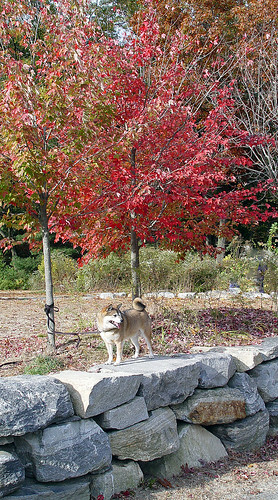 She cannot be off-leash, because anything and everything interests her – even if it is across the street. She doesn’t mean to run away, mind you, but the world is so INTERESTING to a shih-tzu that if you don’t keep her on a leash, she will tear off to look at something, perhaps follow it, and end up lost – or run over. It’s a challenge, but I wouldn’t trade her for anything. So, I completely understand about Wolf! PS Ooops. 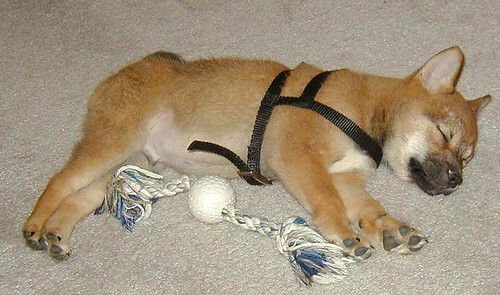 Left out the “h” in Shiba. Sorry about that! You have mentioned Wolf’s Shiba screams before…but what do they sound like? Are they seriously screams or is it more of a baying type thing? Just curious. Funny about them saying that Shibas are like cats. Roxy is that way too. Such a cute picture of baby Wolf!! Wolf has a cute little baby doggie face though! Wonderful photos! Cute and handsome all in one. 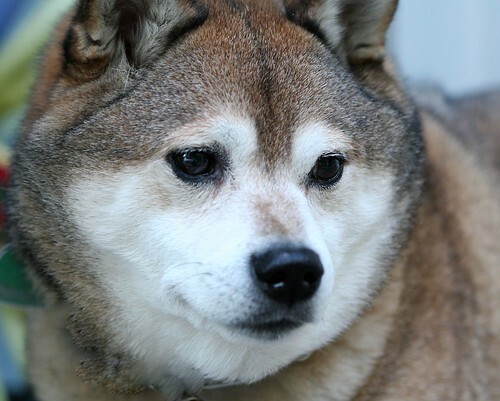 Thanks for putting in the link about Shibas, nothing like a good dose of common sense for a potential new owner. That is one beautiful dog! I’ll stick with an easier breed (mutts come to mind!) but your photographs sure did capture your dog’s beauty. Thanks for the link about Shibas; I don’t know much about them and look forward to learning! Aw! Great use of the words. I didn’t even think about doing Duff “then” and “now”. He was an amazing looking puppy. He had BLUE eyes. Then they turned gold seemingly overnight. Lovely job as always. he was and is still adorable! i love his liddle harness. Wolf, now, is magnificent. Baby Wolf? O.M.G CUTE. 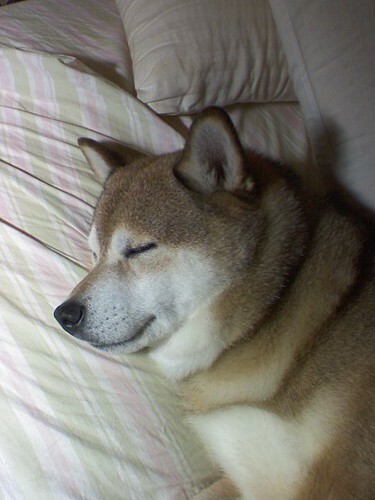 It seems as if every third dog we see over here is a Shiba…very popular in Japan…but, I do believe that Wolf just looks better….and I swear to you that I have a picture of my oldest when he was sleeping that could pass as very similiar to Wolf sleeping…I have to find that picture. weird…but, funny at the same time!! !